We went out of Ciutat Vella (the old city) and into Eixample (the newer area of Barcelona built on a grid, during the nineteenth and twentieth centuries and connecting the older towns of Sants, Gracia, etc.) today, in search of high quality photo printing paper. Not having much luck, we stopped for lunch just before 2pm. All the shops are shut from 2 – 4pm, in order for people to eat lunch and take a siesta. It seems quite civilised to me, especially since all the restaurants do a lunchtime menu costing about 10 € for 3 courses including wine. Antojo… (meaning: whimsy, fancy, caprice, whim) is a recently modernised, family run restaurant, where a good deal of thought and effort goes into the food. We got lucky, there was a queue, but most people wanted to sit indoors and there was an outdoor table free immediately. I ordered pumpkin ravioli in an arugula and langostine sauce. 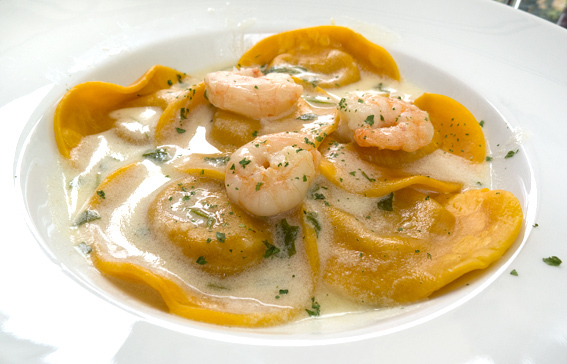 It was all made in house – the ravioli was topped with langostines and came in a delicious creamy sauce. Oli had a classic Valencian dish – fideuá served with allioli. 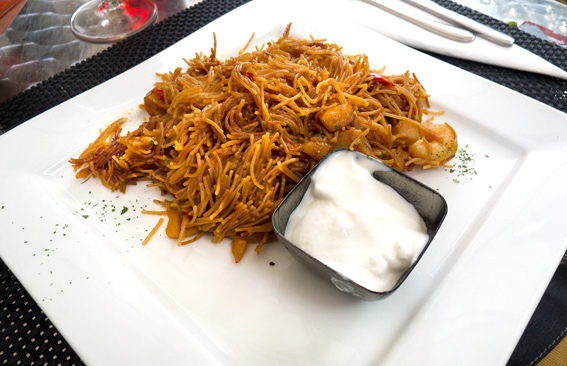 Fideuá is seafood dish, very similar to paella, but vermicelli like pasta is used instead of rice. Apparently, the pasta, fish and stock are cooked together and it’s obvious when the dish is ready, because all the noodles stand upright. I got to taste this one and it was excellent – the taste of garlic in the ailloli goes perfectly with the fish and pasta. 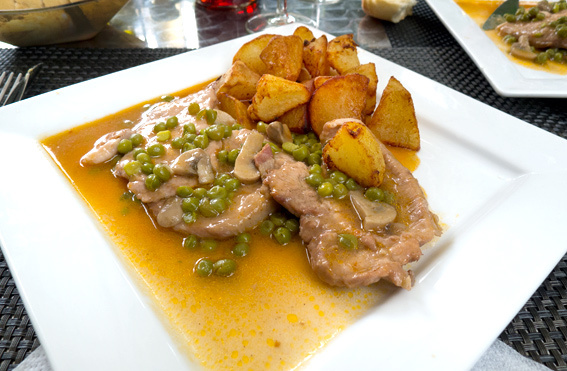 We both ordered the same main course – pork with mushrooms and peas, served with with little fried potatoes. It was lovely tender pork, in a savoury sauce and the potatoes had crispy outsides with fluffy centers. 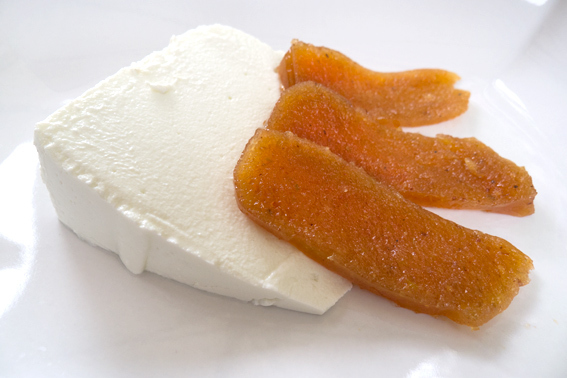 For pudding I had ricotta with membrillo, a solid jelly made with quince and often referred to as quince cheese. This is very popular in Spain, but once upon a time, membrillo was common in England too! 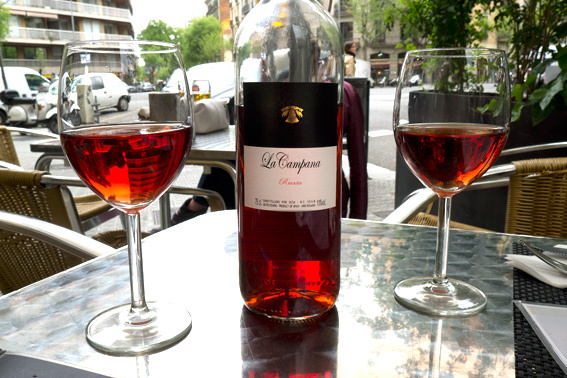 We washed our lunch down with the usual rosado and I swear that the Catalan rosé wines come without hangovers. 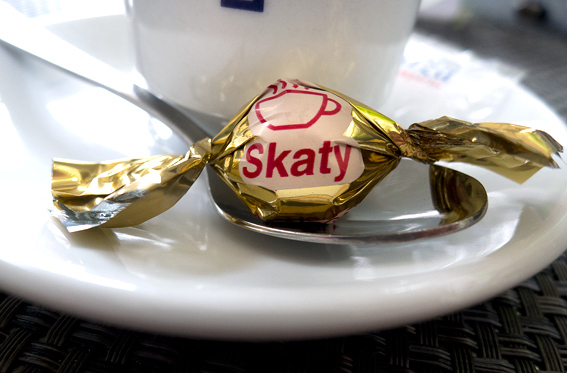 I had a carajillo (coffee with brandy) to pick me up after lunch – memorable because it came with an unusually named Malteser like sweet called a Skaty. The food and service here was excellent. Ironically we found the required photo paper back in Barrio Gotico. This entry was posted in Barcelona, Barcelona Bars and Restaurants, Drink, Eating Out, Fish, Food, Meat, Restaurants, Spanish and tagged allioli, Antojo..., Fideuà, Membrillo, pork, quince, ravioli, ricotta, rosado, Valencian. Bookmark the permalink. Wow, what a terrific series of stellar dining experiences. That pumpkin ravioli sounds delicious. I am going to forward to a friend who is coming to Barcelona next month. What a lunch you enjoyed! I would have been happy with either starter or, better still, give me them both and forget about the main — not that there was anything wrong with it. And definitely bring on that dessert! You need to run an errand every day at lunchtime if this kind of meal is a possibility. When you consider the cost of a sandwich and a drink, this kind of lunch is very good value. I don’t know how restaurants stay in business doing a 10 euro menu, especially one as good as that. I know what you mean, though this place has just had a refit and they don’t open at night! This is all so wonderful I can’t choose one thing to mention specially – many of my favourite dishes are here! I love fideua and often make it instead of paella, and membrillo too, which I always have available because I make enough each autumn to last the year……would love to try all these out in Barcelona one day, and I will…soon! Now why don´t our local restaurants do a menu like this? Antojos are also the cravings pregnant women get, so for a moment I thought you had a big announcement for us! I believe that these wonderful cheap lunch menus are one of the good things that Franco did – I’m told he insisted that all restaurants should do a daily cheap menu to feed ordinary working people. Yes, this is what I´ve been told too and thank goodness this great custom still continues!